It's long been one of San Francisco's most-fabled hotels better known as a turn-of-the-century luxury palace than the happening boutique hotel it's become since 2009. 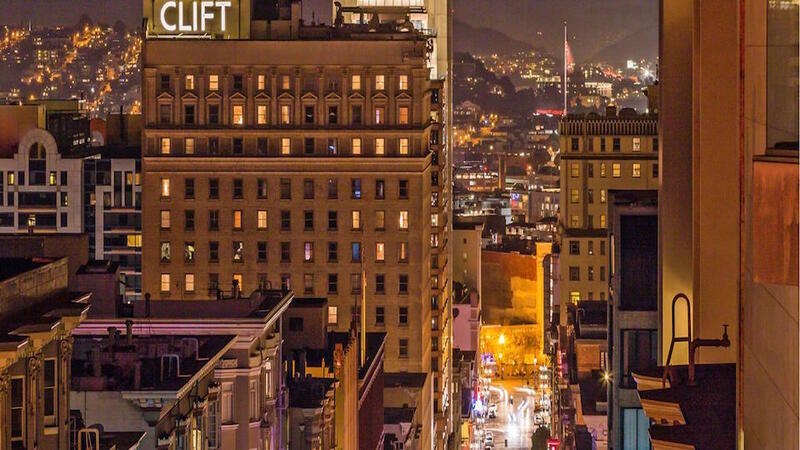 A few blocks over from Union Square and up from Market Street, the neighborhood around the hotel is a lively mix of nightclubs and art galleries that make for an ideal base for those without a car. A brick facade with dark-tinted windows is lined with daper doormen that includes a post-10pm velvet rope on weekends for those trying to score a spot in the hotel ever-hot Redwood Room that's like a SF version of the chain's Sky Bar franchise. Inside, a mix of gilded Victorian furnishings and 35-foot fireplace feels a mix of Alice in Wonderland ala 80s nightclub penned by Phillipe Starck in the years prior to designing the more sophisticated hotel palaces like the Faena in Buenos Aries and even the SLS in Beverly Hills. A series of long corridors open to an array of superior King or studio and loft-style rooms that vary between unbearably compact to adequately-sized. Entry-level rooms are arranged in a creamy color palette with bleached-wood furnishings amongst neutral walls and abstract side tables of fluorescent acrylic. Starting only with the Studio category upwards, ia more unique architecture and design incorporated through curtained sleeping area and more simple white bathrooms with deep soaking tubs. Loft Suites offer open-flow living area with large tufted couches and freestanding beds conductive to romantic weekends in the city. The top of the line room, called the Duplex Suite, is surprising affordable at upwards of $650 per night with 8-person dining room bedazzled with a Murano glass chandelier.